On July 12, which is Plastic-Bag Free Day in Iran, several organizations once again geared up to raise public awareness about the environmental problems posed by plastic bags. For a week, Tehran and several other provinces implemented a program of using biodegradable bags in stores and markets bearing the logo “less plastic, cleaner earth, better health”. 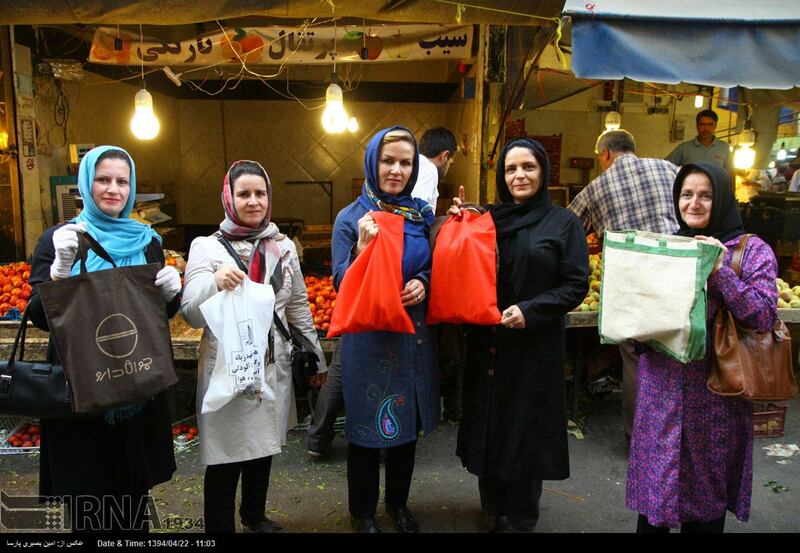 Plastic-Bag Free Day was launched in Iran following a proposal by the Fruit and Vegetable Markets in 2012, which immediately found the support of Tehran City Development offices and the Department of the Environment. The markets have since completely stopped using plastic bags. All plastic bags have been replaced with paper and cloth bags in 15 fruit and vegetable markets across the capital, eliminating the use of 400 million plastic bags. Statistics indicate that 177,000 tons of plastic bags are produced each year in Iran. Across the world, 3.5 million tons of waste is produced each day, and Iran’s contribution to that is now pegged at 40,000 tons a day. The international Plastic-Bag Free Day is observed on July 3. This entry was posted in People & Society and tagged Environmental Awareness, Iran on July 19, 2015 by socialinform. Dr. Mallah was not the first in her family who tried not to produce waste. “My mom would not place the waste outside the house. Back then people produced less garbage and each family would recycle –one way or another – their waste at home. They used to give food leftovers to the poultry. For the past 60 years, Mrs. Mallah and her family have not placed any waste in the garbage can to be collected unless it was recyclable. They bury the waste in a pit in their yard to let it turn into fertilizer. Mrs. Mallah talks with people in different neighborhoods and teachers at schools about the need for waste sorting. […] We can run environmental programs to raise public awareness. We love nature and the environment and we do not work to get money in return. This entry was posted in environment & climate, Personalities, Women and tagged Environmental Awareness, France, Iran, Sorbonne, women on April 3, 2015 by socialinform. Sepideh Jalali, a 25-year-old woman, initiated the charitable campaign which called on people to collect crown corks of bottled water and other plastic containers, hand them over to collecting centers and help buy the wheelchairs for those in need. The plan was set in motion late last year [ended March 21, 2014] and was in full swing in the city by April. Finally it led to the accumulation of a stock of 650,000 corks weighing around one ton. The charity organizers sold the corks to Tabriz Municipality’s Waste Management Organization and bought wheelchairs for six poor people who were physically challenged. When the campaign for collecting corks was in high gear intense rivalry grew between people in Tabriz for gathering even more crown corks. The campaign also drew the attention of people from all cities across the province as well as West Azerbaijan and Tehran. Interestingly, whenever non-local university students who were studying in Tabriz came back from their hometowns they brought in large amounts of corks. The purchase of wheelchairs was not the end of the story. The campaign is still on and Sepideh hopes to promote the worthwhile idea. In addition to bottle caps, she is seeking to collect other disposable items such as waste paper in the future. This entry was posted in People & Society, Women and tagged Environmental Awareness, Iran, People, women on March 25, 2015 by socialinform. Ten-year-old Iranian girl Fatemeh Mahallati has won one of 45 first prizes in the international section of the 14th International Environmental Children’s Drawing Contest in Japan. Her work depicts a number of people working on a farm. “In my painting, I drew animals, flowers and people who are working on a farm and they are happy as they are living in nature,” Fatemeh told the Persian service of ISNA on Sunday. “What I drew in my painting were the things I have previously seen in my visits to farms and green areas,” she added. “The environment and nature are important and we should protect the things concerning nature,” she stated. Fatemeh has been a member of the Institute for the Intellectual Development of Children and Young Adults (IIDCYA) in Raine, a town near the southern Iranian city of Kerman, since 2009. In a message sent to Fatemeh last week, the director of Iran’s Department of Environment, Masoumeh Ebtekar, congratulated her for achievement at the competition. The contest was organized the Japan Quality Assurance Organization (JQA), the International Certification Network (IQNet) and the Tokyo branch of UNICEF. The 6-year-old Japanese child, Kusaka Nana, won the Environmental Best Prize, which is the top honor of the contest. The best prize of the international section was presented to the 12-year-old Ukrainian boy, Oleksiy Rakoma, and the UNICEF special prize went to the 7-year-old Bangladeshi boy, Raihan Fairooz Tarannum. Since 1999, Japan Quality Assurance Organization (JQA) and International Certification Organization Network (IQNet) have been hosting the International Environmental Children’s Drawing Contest for children aged 7 to 15 years old from around the world, supported by UNICEF Tokyo Office. So far, the contest has been held 15 times with over 21,000 entries that this year we’ve had entries from a record breaking 81 countries. In total, we have received more than 220,000 drawings up to now. Full of imagination and artistic sensitivity, children drew pictures about nature and animals, their families and the surrounding area. The pictures also contain the message towards global environment, beyond borders and difference in their background cultures and languages. This entry was posted in music and arts, People & Society and tagged Awards, Children, Environmental Awareness, Iran, Japan, People, women on February 26, 2015 by socialinform. An Iranian documentary, Banooye Urmia, (Lady Urmia) won jury award of Finland Environmental Film Festival held in Vaasa City. The event is held every two years. The film directed by Mohammad Ehsani was shown in the 7th edition of the event on October 1-5 in Vaasa. It is a poetic documentary about Lake Urmia, in the Iranian Azerbaijan, which is drying up completely. Released in 2012 in Iran and distributed by EhsaniPictures, it has also been awarded in the US Rhode Island International Film Festival (RIIFF) and Croatian Environment Film Festival. Lake Urmia (Orumieh) is a salt lake in northwestern Iran near Turkey. The lake is between the provinces of East Azarbaijan and West Azarbaijan, west of the southern portion of the similarly shaped Caspian Sea. It is the largest lake inside Iran, and the third salt water lake on earth, with a surface area of approximately 5,200 km square (2,000 mile square). The environmental catastrophe will not only affect Iran, but also Iranian neighbors such as Iraq and Turkey. The film is narrated in the voice of the Lake itself, asking for help and trying to gain international reaction. This entry was posted in Cinema and tagged Awards, Cinema, Environmental Awareness on October 9, 2014 by socialinform.